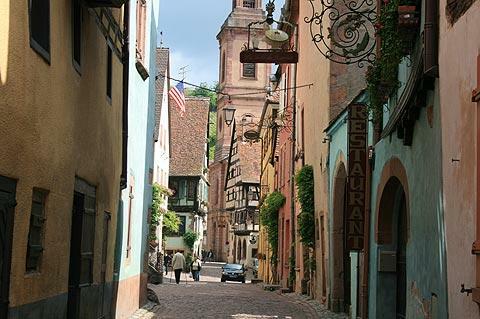 Riquewihr, officially one of the 'most beautiful villages of France', is found 12 kilometres north-west of Colmar in the heart of Alsace. 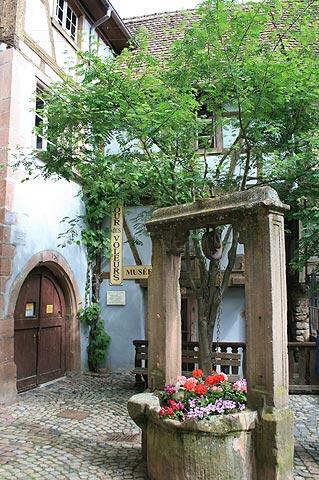 Riquewihr is indeed a very beautiful village and appears to have remained unchanged over the centuries, providing the visitor with a real feeling for how a village in the region would have looked 400 years ago. This village really does seem to have everything that you hope to find in a traditional Alsace village: fortified walls, stone entrance gates, cobbled streets lined with brightly painted half-timber houses, carved wooden beams and stone doorways, wrought iron signs for the shops, lots of flowers....Riquewihr almost looks as if it has just dropped out of a fairytale. 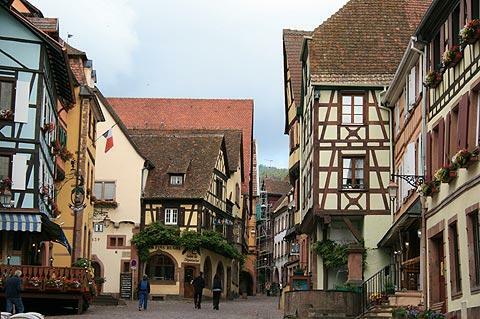 We are enthusiastic about quite a few villages on France This Way, but Riquewihr really is one of our favourite villages in France, and even further enhanced by the surrounding vineyards and forested hills. 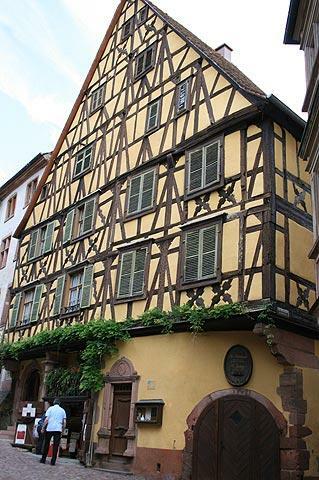 ...although really the charm of Riquewihr is simply to amble through the streets admiring the fine houses many of which date from the 16th and 17th centuries, and still have the attractive courtyards and fountains from that time, and if the Tourist Office is closed you will still come across all the important monuments as you explore! 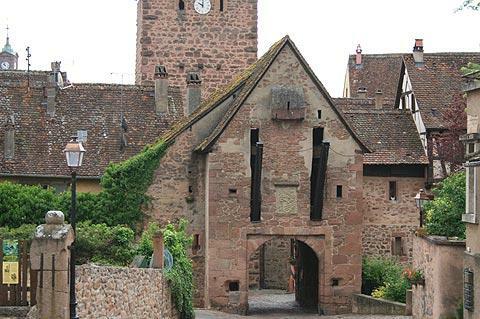 Among the other historical monuments in Riquewihr you can see the Dolder - this tower is also the upper gate of the town and the belfry and part of the original fortifications of the town. The fountain in front of the Dolder tower was originally used to check the capacity of wine barrels hence its name, the fountain of gauging. Note: the view from the top of the Bolder Tower looking along Rue du General de Gaulle is our favourite view in the town while our favourite street away from Rue du General de Gaulle is perhaps Rue de la Caserne, squeezed between the medieval houses and the 13th century fortifications. Another important tower is the Thieves Tower, pentagonal on the outside and square on the inside! You can still see the torture chamber inside the tower. Take a look at the reproduction of an engraving of Riquewihr made in 1644, it shows just how little has changed in Riquewihr over the ages. On the edge of the town centre you can also see Riquewihr Town Hall, a much more classical design than the medieval houses here having been built in 1809. The town has also retained much of its medieval fortifications and a castle and also has a couple of very good museums. The 16th century castle is actually one of the least interesting buildings in the town from the outside, although it provides an interesting contrast to the numerous half-timbered buildings. It now holds the Museum of Communication. 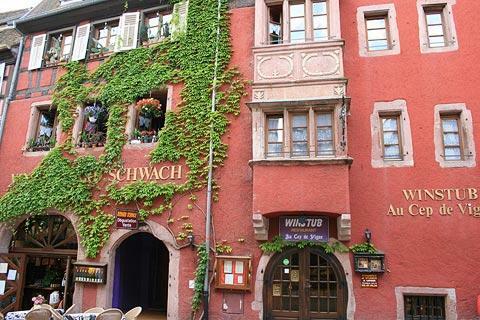 Riquewihr is also an important part of the Alsace wine-growing region, and wine-tasting is a popular activity in the town! 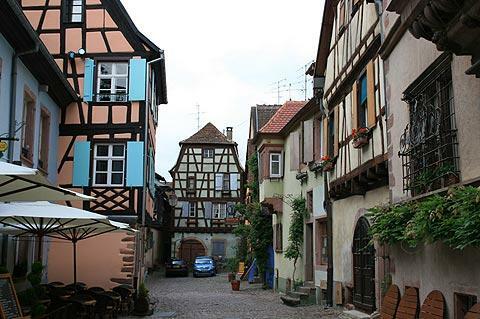 This part of central Alsace has many picturesque villages to explore, several of them very close to Riquewihr. 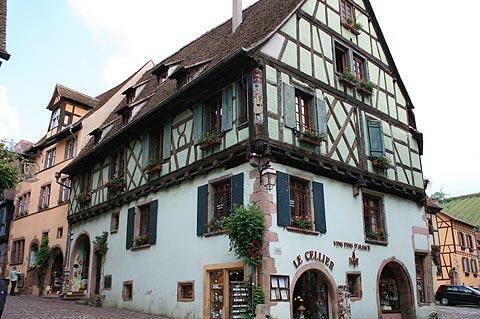 The most popular way to explore the area is by following part or all of the Alsace Wine Route - which will of course also introduce you to the renowned wines of Alsace.